This book will challenge many to rethink long-held beliefs about God and children. It presents a carefully reasoned theological perspective on excellence in children's ministry and explores 20 principles that can provide a framework for your ministry. About "Perspectives on Children & the Gospel"
The leaders of our world in the year 2030 are alive and well, and about 10 years old today. The preachers, the poets, the philosophers, the parents, the planners, all are there. So, potentially, are the pornographers, the petty criminals, the polluters and the drug pushers. What we do now in ministry with children has the potential to change our world. God by his Spirit will bring about any change that lasts, but God has chosen to allow us to be partners in the gospel, and as co-workers with God, it is imperative that we pursue excellence in all that we do. 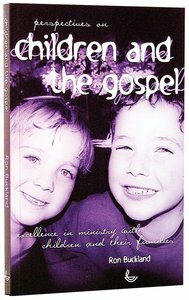 Part 1 of this book contains a carefully reasoned theological perspective on ministry with children and their families, illustrated with examples from the author's vast experience. It aims to challenge many to rethink long-held beliefs about God and children. Part 2 explores 20 principles that can provide a framework for anyone wanting to seek excellence in their ministry with children. A practical summary of the main thrust of the book, it can be used as the basis for an "instant training programme" and a tool for assessing and improving particular children's ministries.